In our recent Best Barleywines in America post, I briefly touched on a conversation that Doc, the Baron and I had over e-mail one day. While discussing the strongest, richest brews on Earth, both Ripped and Sudsy sheepishly confided that they often avoid these monsters because their bodies and brains simply don’t appreciate the overwhelming, overpowering nature of such brews anymore. Perhaps in their salad days, when a young Doc and Baron could abuse their bodies to no end and still bounce out of bed the next morning…perhaps in those days Barleywines and strong ales were consumed like water. But no more. While my two compatriots still enjoy and respect such beers…beers which are often seen as the epitome of the brewer’s craft…they don’t seek them out as readily as they used to. The combination of outrageous ABV percentages and massive quantities of malt sugars can leave their stomachs churning and their heads swimming throughout the evening and into the following morning. While I may have mocked them at the time (and really, how could I not? ), the truth is that I’m in the same boat as my fellow Aleheads. We’re all old now. Ancient, really. I was born during the Carter administration. I didn’t have a cell phone until after I graduated from college. I saw Ghostbusters in the theater for crying out loud! In my youth, hangovers were rare and I could down high-gravity beer after high-gravity beer without my body even noticing. Today? I probably max out at two Imperial IPAs on a normal night. And one Barleywine will do me just fine. While I still love the decadent aroma and taste of a super high-gravity beer, I’ll admit that, on occasion, I have to put a little extra mental effort in to polish off a bomber. What do you want from me? Even Julio Franco got old. That being said, it’s fairly rare that I encounter a beer that’s just too much for me…a beer that is clearly well-crafted and well-conceived, but simply too rich for my blood. I know how ridiculous it sounds to criticize a beer for being “too” full of flavor or “too” packed with complexity, but I have indeed encountered just such a beer. Witness the Bruery Coton. Regular Aleheads readers know of our affinity for the Bruery, a small, envelope-pushing ale factory in Orange County, CA. My first foray into their outstanding offerings was an Autumn Maple I sampled a few months before this humble site was even born. Doc kick-started the Aleheads love for the Bruery with one of his first tasting notes…a 4-hop review (which I heartily agree with) of their Rugbrod. I honestly can’t think of a single beer made by Patrick Rue’s outfit that I haven’t loved immediately. Until, that is, I encountered the Coton. The Bruery is releasing limited edition beers as they celebrate each anniversary of their existence. The beers are being named after the traditional wedding anniversary “gifts”. Papier (French for “paper”…the traditional first anniversary gift) was released two years ago and last year saw the birth of the Coton (I’ll let you figure out that translation). They’re actually the same beer…an English-style Old Ale brewed with Belgian yeast. 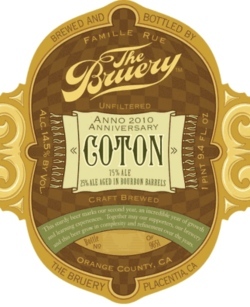 But with the Coton, the Bruery aged the previous year’s Papier in oak bourbon barrels for a year and added a portion of it to the “fresh” Papier. Presumably, this year’s anniversary ale will be the Cuir (French for “leather”) and will have a portion of Coton AND Papier added to it. The goal is to continue adding portions of all of the previous anniversary ales to the new version so as to increase its complexity and average “age”. This aging method is called Solera and is often used when making fortified wines. It is exceptionally rare in the world of brewing since aging beers for such long periods of time is not particularly common. It also requires a tremendous amount of foresight and planning from the brewer since ample quantities of each previous year’s beer must be set aside and properly maintained. Regardless of the results, it boggles my mind that Patrick Rue has tackled this undertaking and I am utterly impressed by the Bruery’s commitment to exploration and innovation. With the platitudes out of the way, on to the reality. The reality is that the Coton is challenging. I don’t mean “challenging” like an uber-hopped Imperial IPA or a complex Oude Bruin…I mean “challenging” like, “I didn’t want to drink it.” The care, ingenuity, and craftsmanship that went into the beer is unquestionable. But the end result is just not drinkable. Getting back to my initial treatise…the Coton is simply “too much”. Slouch Sixpack and I split a 750 of the Coton in two large highball glasses (that’s all we had available). The beer pours a cloudy, murky chestnut color with a massive khaki-colored head that fades faster than any head I’ve ever seen. It was literally gone in seconds. There’s no real lacing…just oily residue on the glass. Once the head settles, it actually looks like a homebrew experiment before bottle conditioning. It just “looks” thick and syrupy. The nose is hugely sweet…maple syrup, toffee, brown sugar and molasses mixed with raisins and prunes. There’s a HUGE vanilla aroma, but because of the high ABV (14.5%) it actually smells more like vanilla extract than vanilla beans. There’s also a faint whiff of oak around the edges…that bitter, charred oak aroma is the only thing preventing your body from going into diabetic shock after the first whiff. Now, nothing in that nose sounds particularly egregious. I’ve described many other beers that have had equally complex, varied, and sweet aromas. But there’s something uniquely suffocating about the Coton. It smells “dense”…like the water has been evaporated out, leaving pure essence of beer behind. I should point out that Slouch and I had been drinking extremely strong, pungent beers all week long before tackling this brew. Weyerbacher Insanity and Victory V-12 were on the menu before the Coton…so it’s not like we were sipping Corona Light and then switching over to this beast. We “should” have been prepared for the experience, but we were simply no match for the Bruery’s offering. And keep in mind, we haven’t even gotten to the taste yet. All of the notes from the nose are present in the taste…dark, ripe stone fruits and metric tons (seemingly) of brown sugar and molasses. There’s a very distinct sour, vinous note that I didn’t detect in the nose but it makes its presence known in force in the middle of the sip. The finish seems to combine the vanilla, oak, and alcohol facets of the nose into one flavor that I can only describe as “pure bourbon”. And while bourbon is the booze of choice for many Aleheads, a shot of Lionel Hutz’s “brownest of the brown liquors” is not what I want waiting for me at the end of every sip of beer. A “hint” maybe…but not an actual shot. While there’s nothing fundamentally wrong with any of the flavors I just described, the sheer enormity of each in the Coton simply wrecks your palate. And I don’t mean “wrecks” like what the Hopsickle does or the B.O.R.I.S. the Crusher…those beers are certainly powerful enough to skew your senses a bit. I mean, the Coton shorts out your nose, tongue, esophagus, and stomach to the point that it’s all you can taste, smell and feel. I like a beer that goes to 11…but the Coton goes to around 13 or 14 and dammit…that’s just too much. As for the mouthfeel…the less said the better. It has the consistency of cough syrup. And drinkability? Umm…have you been reading this? I wanted…desperately wanted…to like the Coton. I wanted to like it to prove my Alehead chops. I wanted to like it to show that no level of intensity or complexity in a beer could get the best of me. But I failed. I appreciated it…but I didn’t like the Coton. I’m sorry, Patrick Rue…I simply wasn’t worthy. Perhaps some hotshot young Alehead will see the beer in an entirely different light. But for us old-timers…the ones who remember a world without the Simpsons…it’s just too much. I simply have to accept who I am now. I won’t be turning the heads of beautiful, blond, 21-year-old girls at a bar anymore (though to be fair, that’s actually never happened to me). I can’t text very fast (those buttons are just too goddamn small). And there are, for the first time in my life, beers that are beyond my capabilities. The Coton defeated me…it was probably the first glass of “good” beer I’ve ever poured that went unfinished. And nothing was more shameful to me than the three inches of brown liquid slowly warming in my glass and silently chastising my inability to consume it. I give 2.5 Hops to the Coton…but it’s not your fault, gentle beer…the fault is mine, and mine alone. Posted in Tasting Notes.Tagged 2.5 Hops, Coton, Old Ale, The Bruery. That is the best 2.5 hop review you will ever write. I honestly had no idea how to approach the Coton. I knew in my mind that it was an excellent beer…but I just didn’t like it. That kind of cognitive dissonance is pretty rare for me and I think the rating reflects that. Previous Post THE MALTERCATION: TAKE IT TO THE HOUSE!